This page is written by the game's inventor, Glenn Nicholls. A Chess Set is intended to be an introduction to the possibilities of the various ideas of Chess and the following games number just five Chess variants based on five well known games of Chess, namely: Western chess, Chinese chess, Arabian chess, Mongolian chess and Capablanca chess and some knowledge of these games is necessary to understand what follows, but the basic rules to these games are readily available and for those familiar with any of them the rules to the others should not take too long to learn. However the five basic Chess Set games of LancerChess, QiPlacements, Arabella, Meridian and Storm themselves have some variations and various ideas and this had led to the inclusion of some extra games and related items. A brief introduction to the game is given. There is a background story for each game but this can be passed over for those who only want the mechanics of the game. There are also representational background additions such as names for players, but these can also be passed over for those who only want the mechanics of the game. The object of the game is stated. A diagram of the board and pieces at commencement is shown. The moves of the pieces, mostly by comparison to the aforementioned well known games of Chess, are described. There is a section on further rules and notes. A description of the game’s variations is given. An Information table is shown for referring to details of the game (some are representational). The Satellite game points scored shown in these tables are those scored when the game is played as a Stand-alone game as usual, unless stated otherwise. After the individual games have been described there is a section on how they are placed into playing groups with bonus points available. There follows a section describing clocks including Phased clocks and these are the type of clocks that are to be used when games score points of value - see below, and clock settings would require to be authorised by myself where points are so scored. After Clocks there is a short section on Circuits and Tours and then a Further thoughts sundries section; finally there is a Listing of items. Background and representational aspects are noted or described as such or are obvious. Were A Chess Set to be in book form the presentation would be of a professional standard and not that of an MS Word document as it is here - unfortunately one is limited by such things. Threefold repetition of moves/position is a draw. The roles of the King and Queen (or equivalent) have been reversed. Where appropriate standard Castling rules apply. Castling has been re-named as Protecting or Safeguarding the Queen. Players should state ‘Check’ when the opposing ‘Royal piece’ is under attack but this is not compulsory. All pieces move on squares and not their intersections as some games traditionally do. Tournament Western chess boards have squares of usually two inches in size, but the boards for the above games could well be very much larger or very much smaller. Role-playing in its various forms is possible with the games. Pieces for the above games are mostly representational or symbolic and life-like except for LancerChess where the standard Staunton (or Staunton type) design pieces are used - at least mostly. For background story purposes pieces are called by various names – e.g. Inhabitants or Participants etc. and there is some leeway in their appearance, tones of colour etc. Games should designate the variation that is being played. Game notation can use full piece descriptions and not just algebraic descriptions. Referees of games may offer the service of moving pieces (helpful if the board is very large), or assist with rules or the settings of clocks etc. and they can enforce the spirit of a game. .....It is difficult to give any sort of answer as to the value of a typical Western chess tournament point.....But.....the 2017 Chess.com Isle of Man tournament had 161 (160?) entrants for the masters category including some of the very strongest players in the world with a top prize of 50,000 GBP - considered a very high sum for a Chess tournament.....the total prize fund for this category was 110,250 GBP and there were nine rounds played.....this gives a total number of masters category games of 160 x 9 / 2 = 720 and an average value per point of 153 GBP, but this is a very blunt measure as only a few players share in the prize fund.....what then would be the (very blunt measure) average value of a typical official Satellite game point.....Well.....I would hope for something very much more than this but for this to happen the presentation of the games would have to be much more interesting and colourful than Chess in its various forms is currently and Role-playing, mentioned above, may be one possibility. The game of LancerChess (one word) is a basic variant of Western chess and the object of this game is to provide a few simple changes to the standard game of Western chess such that provide additional scope and some new and interesting complexities to the game whilst retaining the overall feel of the standard game. Of note is the increased individuality of the minor pieces and particularly that of the movement of Queens’ Lancers on opposite coloured diagonals giving an initial advantage for each side on one set of diagonals – advanced players may find this feature of interest. Also included is the Game variation of Clash and a Circuit puzzle. There are very brief details only of this battle that are known – it is known that the battle takes place in the Disputed Realm (previously known as the Fractured Realm) and it is Long Long Long ago. Reasons and causes for the battle are not known and little else of these mysterious times in this Realm is known either. The object of the Battle (game) is to Checkmate the opposing Queen and this wins the battle. The Knights on G1 & G8 are replaced with Kings' Lancers. These can move to any square either one or two squares away in a vertical or horizontal direction and can jump over any intervening piece if moving two squares. He captures on the square he moves to and not any square he moves over when moving two squares. The Knights on B1 & B8 are replaced with Queens' Lancers. These can move to any square either one or two squares away in a diagonal direction and can jump over any intervening piece if moving two squares. He captures on the square he moves to and not any square he moves over when moving two squares. A Pikeman – he is identical to a Pawn of Western chess except for minor promotion changes as below. 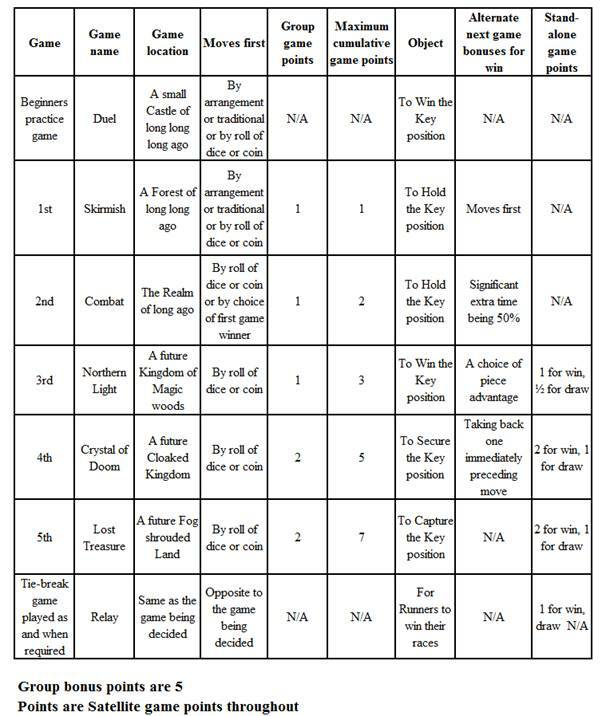 Promotions of Pikemen on reaching their end rank are the choice of King, Siege-tower (that in promotion need not be distinguished between King's or Queen's - see note below on Siege-towers), Baron/Baroness or Lancer. If there is promotion to a Lancer then this must be to a King's Lancer if the colour of the promotion square is the same as the colour of the commencing square of the original King's Lancer or to a Queen's Lancer if the colour of the promotion square is the same as the colour of the commencing square of the original Queen's Lancer (see Further thoughts). If there is promotion to a Baron/Baroness there is no distinction in the name and the promoted Pikeman is simply called a Noble and he has the powers of a Western chess Bishop. Jumping involves linear movement such as the Lancers described above whereas leaping involves oblique movement such as with the Knights of Western chess. It can be seen that at the commencing position the Queens’ Lancers guard the equivalent of the weakly protected (in Western chess) Kings’ Bishop two squares. And also with the Queen's Lancer players who are ambitious to win as north may find it a key piece for the reason mentioned in the introduction. Also of note is that the King’s Lancer can force Checkmate with only his Queen’s help against a lone Queen within a reasonable number of moves and he attacks more squares than does the Western chess Knight on most of the board (48 of 64 squares) and he may give advantages when Protecting the Queen whereas "Long Castling" in Western chess is not considered preferable in most situations. Of further note is that as well as the usual opening line transpositions there are also (part) game transpositions here where LancerChess can transpose to Western chess if all the Lancers are captured (discounting the slight differences in promotion choices - I have kept these to a minimum). Transpositions from Clash of this sort are also possible - see next; also others - e.g. Capablanca chess and variations of this - see Storm. Western chess is often called International chess and this reflects the status this game has been accorded. Individual pieces are usually referred to by Northern or Southern but Orange or White is allowed. Players are usually referred to as the Northern Player, or simply North, and as the Southern Player, or simply South, but Orange Player or White Player is allowed as is simply Orange or White. The board as shown is the Chess-valley board. Once a Tower has been or can no longer be used to Protect the Queen it becomes a King's or Queen's Siege-tower to reflect its greater freedom to attack and fittings should be added to the piece to show this, or alternately a separate piece of different appearance can be placed on the appropriate square - it is no different in effect from a Rook of Western chess though. If one side plays with LancerChess pieces and the other side plays with Western chess pieces this is the game of Clash, with the player of the Western chess pieces described as having the Knights. There is little difference in the strength of the pieces of the two sides though the LancerChess pieces seem to have a small advantage and so the Southern player, who moves first, always plays with the Western chess pieces in any meaningful game or tournaments or matches or suchlike. The roles, powers and vulnerabilities of the Western chess King and Queen are reversed so as to match the LancerChess pieces as are all other aspects of the Western chess pieces matched to LancerChess such as piece names, piece style etc. Note that the Western chess pieces are still on their same squares at commencement e.g. the Western chess Queen is still on D1 or D8. The Background etc. is the same as for LancerChess. The advantage of the LancerChess pieces over the Western chess pieces is, I think, that the King's Lancer is a stronger piece in all phases of the game than the Western chess Knight - see notes to LancerChess above, though not greatly so and this may be somewhat counter-balanced by the Queen's Lancer being "colour bound", but on balance the Lancers seem to have a small advantage over the Knights. 6. from B3 to B2! - B3 to A3? and the Circuit fails. 9. Finishes with A3 to A1 - and the Circuit succeeds with a jump. If on level 1 the King's Lancer were to jump from the number 8 square to the green colored number 27 square this would be the 2D circuit of above. Solutions involving a level jump are also possible and an example is given after the section on clocks. Circuits and the similar tours are possible with other pieces with that of the Knight of Western chess being the best known and examples of these are also given after the section on clocks. QiPlacements (one word where Qi is pronounced as in the English word key) is very much based on Chinese chess – sometimes called Xiangqi. The difference here being the placement phase of QiPlacements - a game within a game - though only two deployment placements are made by each player. Of note here is that boards for QiPlacements would not be of paper or cardboard, as is traditional for some players of Chinese chess, but would be of the finest quality wood or other quality material. Also included is the Game variation of Encounter and two specified deployment placements - Traditional and Accelerated. In the time of spoken Legends and Myths there is dispute over rights to the Stream that runs between the Rainbow Territories as this Stream is said to have magical healing properties and though this is perhaps but legend and myth only there are many who believe it to be true and there has finally come a time when battle is about to commence to decide who has priority over rights to this supposedly Magical Stream. The object of the Battle (game) is to Checkmate the opposing Princess and this wins the battle. The board shown above is that used at the very start of the game where the Cannons are awaiting placement.....the Forbidden placement squares that are explained later can simply be a removable overlay and then the rest of the game can take place on a board without them as shown below and some players may prefer not to have these squares shown at all, but in tournaments or matches or suchlike they must be shown during placement and then after placement they must not be shown for the remainder of the game. Soldiers – his powers are identical to Soldiers and he promotes to a Leading soldier on his sixth rank who is identical to the promoted Soldier of Chinese Chess and he should differ in appearance to that of an unpromoted Soldier. Awaiting Placement – see below: Cannons – its powers are identical to Cannons. First there is a placement of Cannons to unoccupied squares within their own Territory, other than the Forbidden squares – see below. The first Blue Cannon is placed then followed by the first Green Cannon; then the second and last Blue Cannon is placed followed by the second and last Green Cannon. This is called the Placement phase. 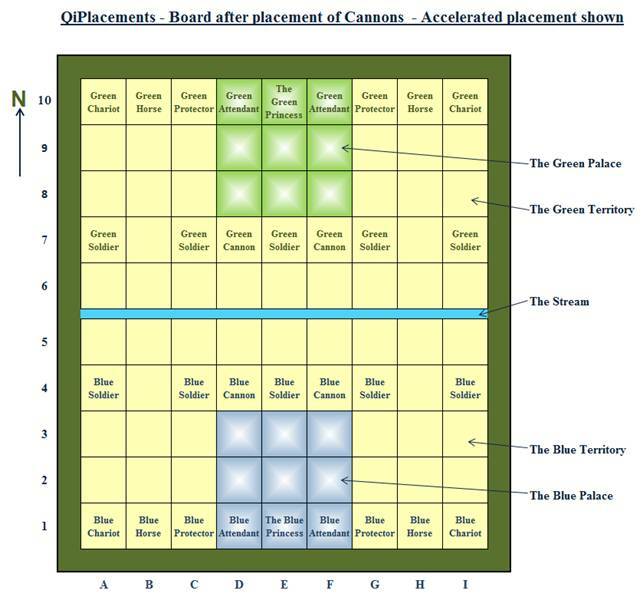 After the placement of Cannons there follows the Engagement phase where Blue moves first and moves are then played alternately. As part of the background ethos it is forbidden, when placing them in the placement phase, to train a Cannon on a Princess, a Protector or a Chariot – all are initially undefended – and so the Forbidden squares as shown on the board are not permitted to have a Cannon placed on any of them. It is permitted, however, to train a Cannon on a Soldier – see Note below. During the Engagement phase the Forbidden squares (that are also the Soldiers’ promotion squares) are the same as ordinary squares and have no different effect (other than promotions) than any other ordinary square, also Cannons are now free to attack any piece, whether defended or not, in the same way as any other piece is free to. The Forbidden squares benefit initially undefended pieces from immediate Cannon attacks, but since these squares benefit Soldiers by their promotion when (if) reaching them they do not also have the benefit of immunity from having a Cannon initially trained on them. Traditional placement: If south places his first Cannon to square H3 then this must be construed as an offer to play Traditional Chinese chess and if north places his first Cannon to B8 then he is deemed to have accepted this offer and then south must place his second Cannon to B3 and north must place his remaining Cannon to H8. This is effectively Chinese chess and is called the Traditional placement. Accelerated placement: If south places his first Cannon to square F4 then this must be construed as an offer to play a placement variation called the Accelerated placement and if north places his first Cannon to D7 then he is deemed to have accepted this offer and then south must place his second Cannon to D4 and north must place his remaining Cannon to F7. This is called Accelerated because if played from the Traditional Chinese chess placement position it takes twice as many moves for the Cannons to reach these squares i.e. four moves each side. Note that if neither the Traditional placement nor Accelerated placement are played then the term Open placement is used though this would be assumed if nothing was otherwise stated. Tests suggest that with correct play no significant advantage can be gained from the placement phase. Copying placements during the placement phase can lead to significant loss of material. 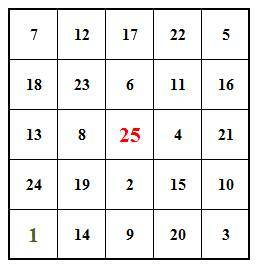 Discounting the required order of Traditional and Accelerated placements, the possible number of placement moves is 26 x 26 x 25 x 25 = 422,500 and if there were no board symmetry this would lead to 105,625 positions, but there is mirrored placement symmetry and some positions give advantage – however as something of a guess I would think viable placements run into thousands and perhaps well into thousands. Princesses, like Generals in Chinese chess, are forbidden to face each other along an otherwise unoccupied file. Pieces are 3D and not disc-like as they are in Chinese chess. Note that Generals in Chinese chess are piece names and not player names as they are in QiPlacements. It has been said that Chinese chess is probably played by more people than any other board game in the world. Individual pieces are usually referred to by Green or Blue but Northern or Southern is allowed. Players are usually referred to as the Green General or the Blue General but Northern General or Southern General is allowed as is simply Green or Blue or simply North or South. The Stream separating the Blue and Green territories is representational only and has no actual effect on the game as the river has no actual effect in Chinese chess. Horses and Chariots and Cannons are manned. This is simply playing QiPlacements where one side plays with the Traditional placement whilst the other side plays with the Accelerated placement. The Accelerated placement would seem to have a small advantage and so the Blue General (south), who moves first, always plays with the Traditional placement in any meaningful game or tournaments or matches or suchlike. Note that there is not a set procedure of placing Cannons that obliges players to adopt this placement pattern as there is with the Traditional and Accelerated placements and if Encounter is to be definitely played this has to be specifically stated as being so. The Background etc. is the same as for QiPlacements. The advantage of the Accelerated placement over the Traditional placement would seem to be the quicker control of open files by the Chariots with the possibility of them then moving into the opposing territory. The game of Arabella is based on the game of Arabian chess that was the game Western chess developed from. There are in this game a few changes from Arabian chess that hopefully will add some new and interesting features, the most noticeable being the Flying carpets and the Jinis. The game could be called Jini if wished so. Note that the moves for the pieces are set out in a Table and in a way that I think is suitable here. Also included is the game variation of Invasion and there are Traditional and Modern variations with regard to some optional moves. The short background story here makes reference to the story of Aladdin that has been put into film and performed as a theatre play and is well known and readily available. Aladdin was a real life character some centuries ago and an outstanding Arabian chess player - perhaps the strongest of his time. A wicked Magician has sought to usurp the rule of a faraway Kingdom together with his wicked Enchantress by capturing the King’s young and beautiful and only daughter while he is far away visiting friendly Kingdoms and so his young but brave adopted and orphaned son must defend the Kingdom until he returns. Prior to the battle commencing the wicked Magician was attempting to deceive the Kingdom into believing his intentions were honourable with regard to the Kingdom in that he wished for the hand of the Princess and no more (he in fact sought to rule the Kingdom by this way and knew of the King’s absence and intended to take advantage of this). As a token of good faith each side exchanged their great Lamp and their Jini who resided within them, but the Kingdom’s Ward lost trust and refused further talks and the wicked Magician refused to return the Kingdom’s Lamp and Jini, mistakenly believing him to be more powerful than his own. Thus at the start of the battle both Jinis are within their Lamps and are prisoners of the opposing side and the wicked Magician and his wicked Enchantress now seek to rule the Kingdom by the forceable capture of the Princess. The object of the Battle (game) is either to Checkmate the opposing Princess or Enchantress or to Capture all opposing Persons and this is shown in the Table mentioned in the Introduction for suitability and clarity – either wins the battle. The Prince/Magician or the Princess/Enchantress can move to the square of their Flying carpets and embark on (board) them and then the move and so capturing ability of the Flying carpet comes into play until they disembark by their own move - they can do this at any time (provided within Checking rules) but until disembarkation the move of the Flying carpet is over-riding. As can be seen the Prince/Magician can embark on either Flying carpet whereas the Princess/Enchantress cannot. Flying carpets can only carry one at a time and only of their own side - their move is not blocked by an intervening piece. A Check can be escaped by the move of the Flying carpet or by the Princess/Enchantress disembarking when they are on a Flying carpet. No others can embark on a Flying carpet except those mentioned above. When on a Flying carpet both the Flying carpet and the Prince/Magician can give check or capture a piece by virtue of their own individual moves as can the Princess/Enchantress also capture a piece by virtue of their own individual move (provided within Checking rules) but this would entail disembarkation. Capturing a Flying carpet would also mean the Prince/Magician being captured if on board. Jinis do not have the ability to be embarked upon as do Flying carpets. Although a Jini’s move includes that of a Prince/Magician he is not of Regal status. There is no castling type move. The classification of Persons is as shown in the moves table i.e. Horsemen and Swordsmen. When on a Flying carpet basic Checkmate situations of a Princess/Enchantress require different moves to that of the King of Arabian chess or Western chess and when not on a Flying carpet some potential Stalemate situations can perhaps be more easily overlooked than with the aforesaid King, for example a Swordsman of the Kingdom on D3 would prevent the Enchantress from moving at all if she were on D1 (a square that a Flying carpet cannot land on). A lone Jini can force Checkmate against a lone opposing Princess/Enchantress even if on a Flying carpet, but though this is only a theoretical situation the moves played to bring this about would still be relevant in practice in games. A lone Magician/Prince can force Checkmate against a lone Princess/Enchantress if not on a Flying carpet and though again this is only a theoretical situation the moves played would also still be relevant in practice. Notwithstanding the Jini's checkmating ability there are situations, due to a player needing at least one of his Persons on the board, when a promotion choice to a Jini or a Horseman could involve complex considerations. Arabian chess was widely played for over a thousand years - longer by five centuries than Western chess. Individual pieces (characters) are usually referred to as (Characters or those) of the Kingdom or of Enchantment e.g. a Horseman of the Kingdom or a Flying carpet of Enchantment though Regal characters are still called simply by title e.g. the Princess or the Enchantress. It is though allowable to call pieces as Northern or Southern although Regal characters would again still be called simply by title. Players are usually referred to as the Kingdom’s Ward or the Magician’s Ward but Northern Ward or Southern Ward is allowed as is simply North or South. 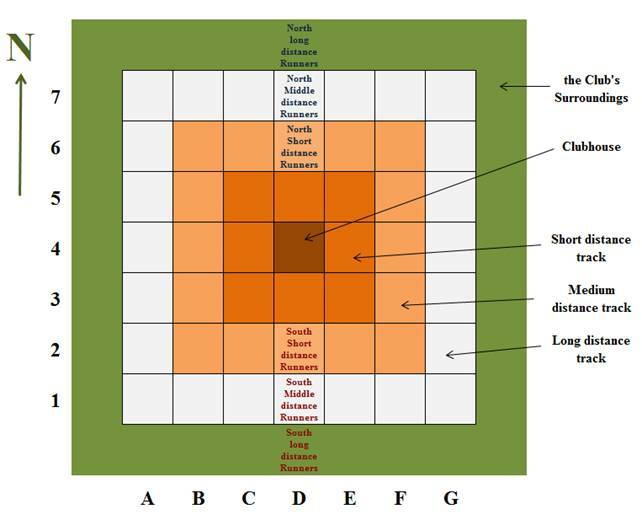 Swordsmen may or may not have an initial optional two square move as Pawns do in Western chess - see variations below. In this variation Swordsmen do not have the optional initial two square move as Pawns do in Western chess and so en passant rules do not apply. in this variation, that has to be agreed by both players, Swordsmen have the optional initial two square move as do the Pawns of Western chess and en passant rules apply. With reference to the above Traditional and Modern variations the procedure is that if a player wishes to play the Modern variation then he needs to place his Regal pieces on opposite squares to that shown in the diagram and this is construed as a wish to play the Modern variation; if the other player also places his Regal pieces likewise he will also be construed to wish to play the Modern variation and a small gesture by each player pointing out the variation situation needs to be made as confirmation of their agreement to the variation and play proceeds with the Regal pieces on these different squares - this is the case whenever the Modern variation is played. If either player has misunderstood the variation situation after a few moves (considered to be by five moves by each player) they may point this out whereupon the game must recommence with a clear understanding of what variation is to be played. If either player does not show a wish to play the Modern variation then the player who does show a wish to play this variation must then place his Regal pieces onto the squares as shown in the diagram and the Traditional variation is then played. There is some background story and representation when releasing a Jini (who is inside his Lamp at the start of the game) that is equivalent to a Swordsman’s promotion, but here the Swordsman must look after the Jini’s Lamp - his home, for the Jini must return there after the battle. If captured a Jini must return to his Lamp but he can be released again in the same way though there is only one Jini for each side and whose Lamp is past each side’s end rank. If a side has released their Jini and he is on the board then a Swordsman of such side upon reaching his end rank must then be promoted to a Horseman. There can and should be ornamental Lamps placed on the borders of the board and if a Jini is released the Swordsman who has done so would be placed alongside his Lamp. A Swordsman can (promote) under-promote to a Horseman instead of releasing his Jini as may happen e.g. to prevent loss by capture (or absence) of all Persons - a player needs at least one Swordsman or Horseman on the board or a loss occurs. Jinis are in the spirit and duration of game play only - they live in their Lamps otherwise and so are non-forceful, but this has no practical effect on the game.....a Jini's Lamp is a magical home that has everything inside it that a Jini could wish for. Persons requiring capture in order to win do not include Regality (of different status) or Siege-towers (that are constructions) or Flying carpets (that are Talismans) or Jinis (of game play spirit). Horses are available for promotion purposes. A further background point is that the Prince also has no siblings. In this game variation of Arabella the only differences are that for the Characters of the Kingdom to win they must now Checkmate the Magician, not the Enchantress, and that the Magician and the Enchantress cannot board their Flying carpets - these are now actually non talismanic Catapults but still move the same and these Catapults, like Carpets, are not counted as Persons that require capturing to win. Those of the Kingdom may have a small advantage and so in any significant game the Characters of Enchantment are south and always move first. The rules regarding the Traditional and Modern variations also apply here and so there are two variations of Invasion here and those of the Kingdom are said to have the Talismans. 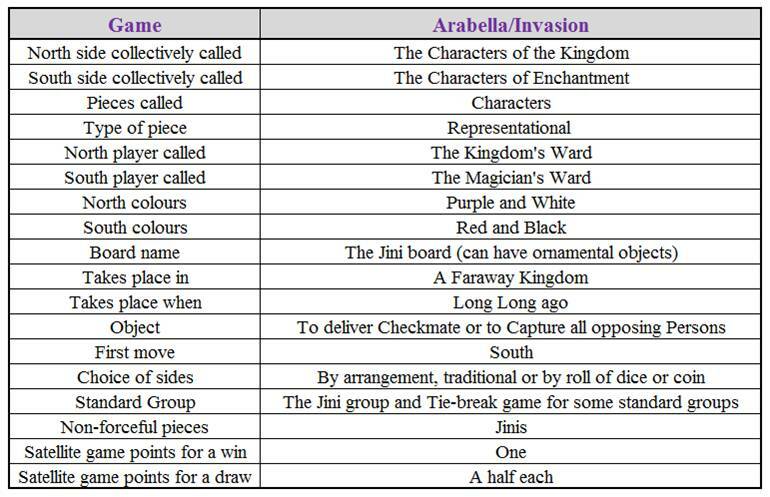 The deployment at commencement is the same as Arabella depending on whether the Traditional or Modern variation of Invasion is played. 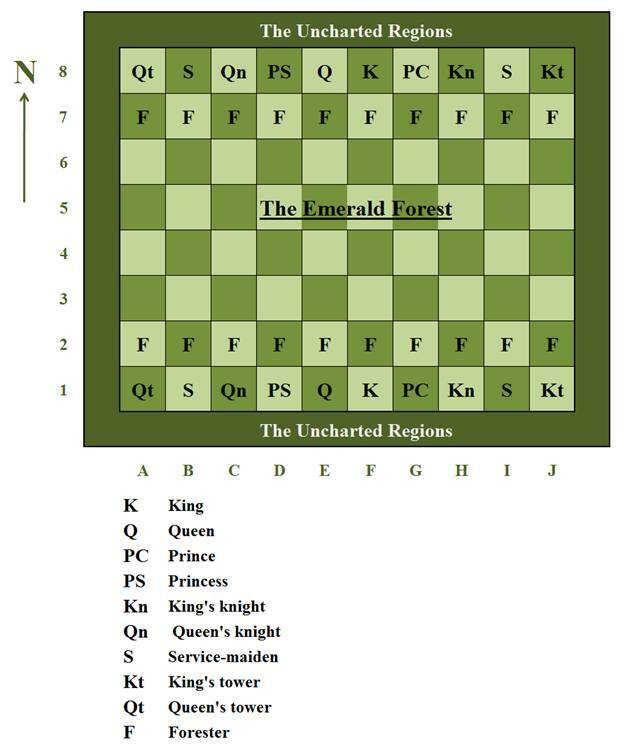 With Invasion and the Traditional variation (no optional initial two square Swordsmen moves) the Characters of Enchantment are now effectively the pieces of Arabian chess except for the promotional options for Swordsmen, also there are some differences in other rules e.g. winning by capturing all pieces but the King; but this game would much effectively be Arabian chess playing against Arabella. It perhaps should be noted in this variation that although it is harder to Checkmate the Magician than the Enchantress (she now being unable to board a Flying carpet) he is less effective as an attacking piece now being vulnerable to Check and Checkmate. There are further possible Invasion variations e.g. where those of the Kingdom must still Checkmate the Enchantress to win but where those of Enchantment must Checkmate the Prince to win and where the rules on Flying carpet boarding are as mentioned above, but these are not considered mainstream variations. Meridian is a game that has features of Western and Chinese chess and one or two of Mongolian chess – it is not intended to be a full combination of these games however, but rather a fit between Western and Chinese chess with something of Mongolian chess included and there are two core variations called the Western variation and the Eastern variation plus a further variation called Combination that combines elements of the two core variations. There is also a rule variation called the Escape rule and this is something of a novelty and is considered as a variation suitable for exhibition play that some may find to be an interesting challenge and is also allowable up to high level tournaments or matches or suchlike. There are, no doubt, many ways of bringing together elements of Western and Chinese chess and perhaps other Chess, but here I have drawn together the features that I personally find to be too associated with these games to leave out; but this has led to two core variations though both seem to give scope for attacking play and games may sometimes be quick and fierce. Where there are differences between the Western and Eastern variations these are stated, otherwise the two variations are the same. The differences are straightforward however. Combination is explained at the end along with the Escape rule. Over time a once great and huge Empire has begun to fragment into a number of Kingdoms within two Khanates and the two Principal Kingdoms are the neighbouring Sapphire kingdom of the Northern Khanate and the Golden kingdom of the Southern Khanate, and as their names suggest much of the source of their wealth derives from Sapphires and Gold. There is though an area of land between them that contains huge deposits of both of these and both Kingdoms have claimed the land as their own and this area has become known as the Disputed lands. This situation has led to their Warriors, traditionally known as the Sapphire Horde and the Golden Horde, to mobilize and battle commences shortly afterwards. Western variation: The King and Queen of both Kingdoms are themselves young and do not as yet have children and so there are no heirs to either Kingdom. Eastern variation: The King and Queen of both Kingdoms are too elderly to directly participate in the battle and so both their young heirs (the Princes-royal) do so together with the young Princesses-royal – it is considered essential for a Prince-royal, in particular, and a Princess-royal to prove themselves in a situation of difficulty or conflict. Here the Kings and Queens take charge of the detention of captured Warriors for by tradition captured Warriors of rival Khanates or Kingdoms are treated as guests with hospitality until their release and so both Kings and Queens prepare areas of their Palaces for such. Note: A Princess-royal is the title given to the eldest child but where there is a son, and by tradition the eldest son is the heir. Western variation: The object of the Battle (game) is to Checkmate the opposing Queen and this wins the battle and the winning Kingdom (and Khanate) will annex the Disputed lands. Eastern variation: The object of the Battle (game) is to Checkmate the opposing Princess-royal and this wins the battle and the winning Kingdom (and Khanate) will annex the Disputed lands. The annexing of the Disputed lands is of course background story. Western variation: A King – he is identical to the Queen of Western chess. Eastern variation: A Prince-royal – he is as the “Snow Panther” of Mongolian chess – a game played for centuries in Mongolia, and moves both as the Rook of Western chess (or rather the Chariot of Chinese chess since he has no castling abilities) and a non-royal King of Western chess i.e. he has a single diagonal move in addition to his Rook’s move. Western variation: A Queen – she is identical to the King of Western chess except that she is confined to her Palace as is the General of Chinese chess – also the Queens may not face each other along an otherwise unoccupied file as with the Generals in Chinese chess. Eastern variation: A Princess-royal – she is identical to the General of Chinese chess and so she is confined to her Palace as is the General of Chinese chess – also the Princesses may not face each other along an otherwise unoccupied file as with the Generals in Chinese chess. A Chariot – its powers are identical to the Chariots of Chinese chess. A Cannon – its powers are identical to those of the Cannon of Chinese chess. A Horseman – he is identical to the Knight of Western chess. A Shieldsman – he is identical to the Counsellor (sometimes called an Adviser or Mandarin or Guard) of Chinese chess and so is confined to his Palace. 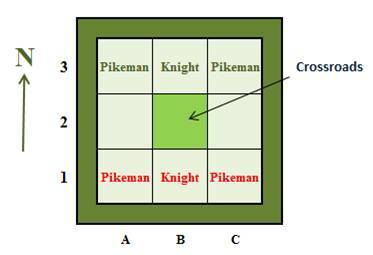 All Pikeman only have an initial one square move except those on the A and I files that have the optional initial two square move as with Western chess and so the en passant rules would apply in their case, though not others. Western variation: If his King is captured he can rescue him though he is himself captured in doing so, but he will later be given much reward should his side win the battle. Eastern variation: If his Prince-royal is captured he can rescue him though he is himself captured in doing so, but he will later be given much reward should his side win the battle. Western Variation: A Pikeman can promote to a Pike commander who can move or capture one or two squares in any direction but cannot jump i.e. he can only “slide”. Eastern Variation: A Pikeman can promote to a Pike leader (often called a Leading pikeman) who can move or capture one or two squares vertically or horizontally but cannot jump i.e. he can only “slide”. In both variations a Pikeman can promote to a Horseman. What variation is played is by arrangement, agreement or by roll of dice or coin. I have refrained from bringing the Bishop of Western chess into Meridian (possibly by Pikemen promotions) - Chinese chess, like the Eastern variation, does not have a long-diagonally moving piece and the Western variation already has a King who can move so.....to bring this in would, I think, tilt things too much towards Western chess and though the possibility remains it is most unlikely to happen. Individual pieces are usually referred to by Sapphire or Golden but Northern or Southern is allowed. Players are usually referred to as the Northern Khan or the Southern Khan but simply North or South or simply Sapphire or Gold is allowed. In something of a reverse between these two games the Western variation is usually the more tactical and if a comparison with Western chess were required I would say this variation has something of nineteenth century attacking Western chess about it – but only limited comparison can be drawn with this. The Eastern variation perhaps plays more like a typical game of Chinese chess but again only a limited comparison can be drawn. The Disputed lands area of the board is decorative only and has no effect on the game in any way but this area also straddles the Northern and Southern khanates as well as the Sapphire and Golden kingdoms. Chariots and Cannons are manned. Though a Khan does not appear on the board during the battle his powers are those combined of both a King and a Horseman (see Further thoughts). Pikemen may not enter their own Palaces - hence the placements of them at commencement; this does not apply either to the playing rules or as a representational point for Pike commanders or Pike leaders who may enter them (see Further thoughts). This game variation of Meridian is where one player has a King and a Princess-royal whilst the other has a Prince-royal and a Queen, and the player with the King is said to Guard the Princess-royal whilst the player with the Prince-royal is said to Guard the Queen. The Rules are as given except Pikemen have the option of promoting to either a Pike commander or a Pike leader or to rescue their King/Prince-royal or promote to a Horseman. The player with the King, perhaps as expected, seems to have an advantage but this may not be as much as expected. The Southern player, who moves first, always Guards the Queen in any significant or meaningful game or tournaments or matches or suchlike. For the player who guards the Princess-royal the King is able enough to participate in the battle but the Queen is not. Also for the player who guards the Princess-royal the only and younger son has been seriously injured following a fall from his horse and is unable to participate in the battle but will recover. For the player who guards the Queen the King has been seriously injured whilst hunting but is expected to recover, though is unable to participate in the battle. Also for the player who guards the Queen the only and younger daughter is considered too young to participate. 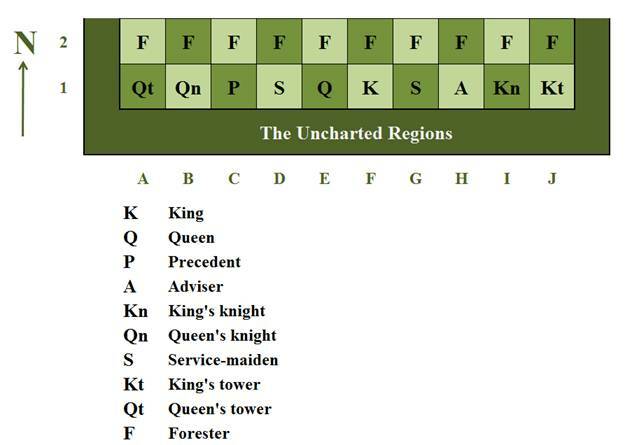 It is also possible for there to be variations where both players have a King and Princess-royal or both have a Prince-royal and Queen, but these are not considered mainstream variations. There is for the core variations of Meridian and Combination this possible additional rule whereby a player may, if in an otherwise Checkmate position, move his 'Royal piece' outside of the Palace (but not into Check of course) and if this escapes the otherwise Checkmate position the result of the game is a 'Draw by Escape' and the move should be played to leave the game's final position. If the Royal piece cannot escape Checkmate in this way then the game ends as usual in this Checkmate position. The move to outside of the Palace must be the usual one for the Royal piece and can be a capture. A simple way to express this rule might be to say a Royal piece can only leave the Palace to escape being in Checkmate whereupon the game is a draw. The rule is not allowed in QiPlacements. Satellite nominal points only (see General Notes) may be awarded for exhibition play, or scored for tournaments or matches or suchlike when this rule is in force and are two for a win and one each for a draw.....the term awarded is the one usually used for the scoring of points in exhibition play, but may also be used where considered suitable. There are in the Palaces secret underground passageways that are known only to the Royal piece (and a few select other such) and these lead to the surrounding areas (squares) outside the Palaces and if the the Royal piece escapes through the passageways and is not attacked outside the Palace (in Check) the Royal piece will make good their escape - but these passageways can only be used to escape being in Checkmate. During a game the possible unattacked squares outside the Palace that the Royal piece could move to are called Escape squares - these will change throughout a game as and when the Royal piece moves within the Palace and they are only potential Escape squares until and unless used (by means of the secret underground passageways mentioned above) when the one actually used together with the square the Royal piece moved from is known as the Escape route. Note that Escape routes also change throughout a game as and when the Royal piece moves within the Palace and are also only potentially so until and unless used. (Potentially) There are eleven Escape squares with a Queen having nineteen Escape routes and a Princess-royal nine Escape routes. The rule variation can be designated as with Escape routes or with Passageways or with Secret passageways. When in a winning position or when attacking players may need to be aware of Escape squares/routes in a similar way as they may need to be aware of Stalemate possibilities. Storm has two Board variations (10x8 squares and 10x10 squares) and is based on Capablanca chess - invented by Jose Raul Capablanca. As with Capablanca chess the games often produce complex tactics. Although playing these games on a 10x10 board can produce these complex tactical positions on a 10x8 board it has been noted when playing Capablanca Chess that the pieces are quicker to engage and so this is considered here to be the main and preferred board size, but variations for both are included. Jose Raul Capablanca was a world Western chess champion. Also included is the Game variation of Crossfire. The object of the Battle (game) is to take Captive (checkmate) the opposing Queen and this wins the battle. Note that only the 10x8 board is shown but the commencing array is the same for a 10x10 board. When Protecting the Queen she now moves three squares towards the relevant Tower instead of two as does the King in Western chess castling. A Forester – his or her powers are as a Pawn except for when promoting on reaching their end rank. Alternately placed Foresters are boys/girls (or men/women) but they need not face each other. Promotion (compulsory) choices for Foresters are: Either to be exchanged (they actually free them) for a captured fellow King, Prince or Princess or to promote to an Aristocrat (he/she is the same as a Siege-tower - see note below on Siege-towers), a Knight (he/she is the same as a Knight and not distinguished between a King’s or a Queen’s Knight) or a Noble (he/she is the same as a Bishop). Note that the title of Dame has been replaced by that of Knight. 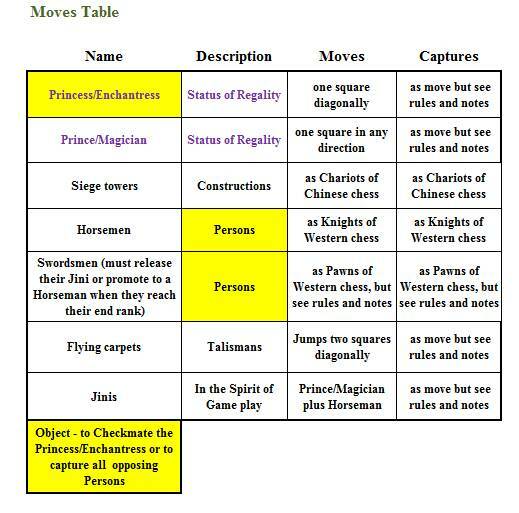 The moves of the Prince and Princess are described with reference to the following diagram where they are situated on an empty board. The squares shown in the diagram in black are the example squares they are occupying. 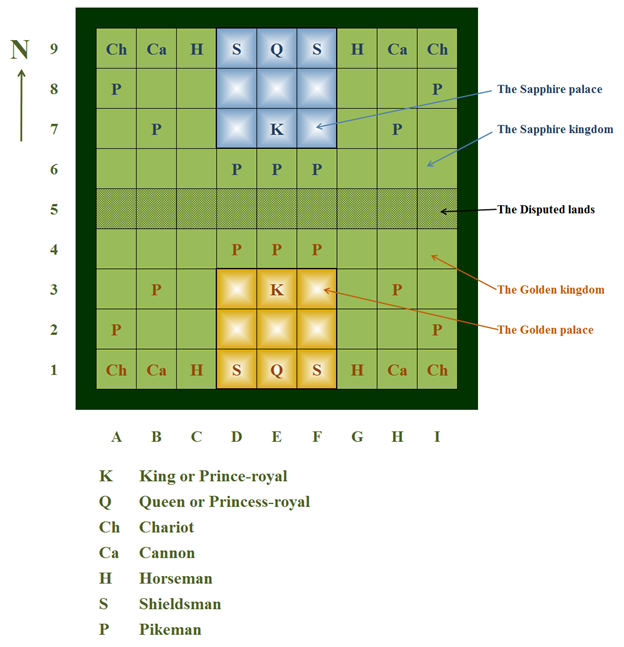 The Prince and Princess can first move the same as the Knight and these squares are called the strike squares and are coloured orange in the diagram; they can move to or capture on these squares like the Knight i.e. regardless of any intervening dwellers. From the strike squares the Prince or Princess can then continue along the associated follow-through squares (or Paths) as shown in the diagram coloured yellow - they can slide along these follow-through squares to move or capture in the manner of the Rook for the Prince or in the manner of the Bishop for the Princess.....they cannot jump (or leap) over any dwellers situated on the follow-through squares.....they cannot leap (or jump) over a strike square that is occupied i.e. 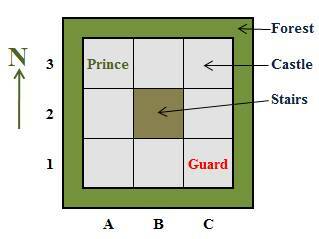 if a strike square is occupied by any piece then the Prince or Princess cannot move to or capture on the associated follow-through squares.....if a strike square is occupied by an opposing piece then the Prince or Princess can capture this piece but cannot move to or capture on the associated follow-through squares. The follow-through paths are as shown in the diagram and cannot be varied by turning off from the strike squares at any other angles to those shown - these paths are described as of ongoing direction and most closely match the direction of the associated Knight’s move. The Prince and Princess can give rise to a form of triple check and blockable double check as well as the usual form of non-blockable double check. Capturing and captured dwellers are usually stated as taking captive and held captive. Green has been included in the colours of the pieces as representing the Emerald Forest. 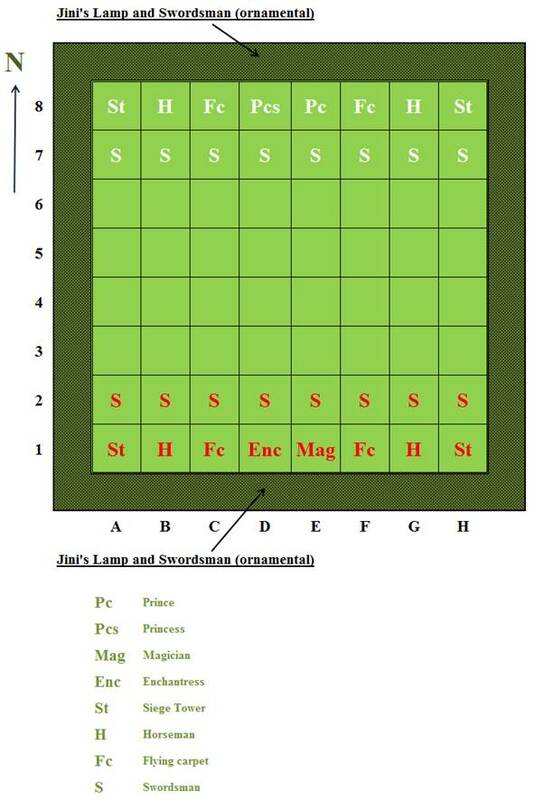 The reason for south’s dark green and north’s light green (see Table) is so that the Queens have some of the colour of their commencing squares (see board) – this accords with current Western chess where the white Queen commences on a light square and the black Queen on a dark square - but there should not be a great deal of these green colours used. The Southern Prince and the Southern Princess are non-forceful dwellers unlike their forceful Northern counterparts – this is because the Southern dwellers have chosen a different form of rule to those of the north as is seen in Crossfire – see later - this has no practical effect on the game however. Service-maidens can be distinguished by the fact that those on lighter squares are light haired whereas those on darker squares are dark haired and they are usually called such e.g. the Northern light haired Service-maiden. If played on a 10x10 board then the only difference to the rules of the 10x8 board is the initial move of the Forester who then has an additional option of moving three squares as well as the usual one or two. The en-passant rules and logic also apply to this additional optional move. 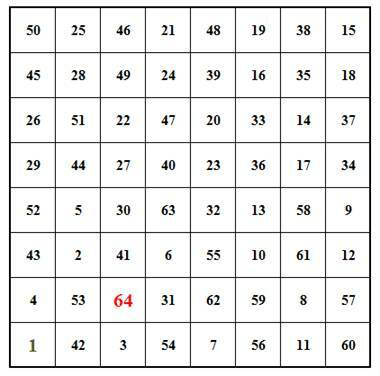 Sometimes a 10x10 board would be played at the very highest level but the 10x8 board would generally be preferable. Crossfire is effectively the playing of Capablanca chess against Storm and the Capablanca pieces (dwellers) are also effectively deployed as in Capablanca chess. The Capablanca pieces are at a material disadvantage since the Precedent and the Adviser are not as powerful as the Northern Prince and the Northern Princess. There are however two advantages for the Capablanca pieces to offset this: firstly is that the Capablanca pieces are always south in any meaningful game or tournaments or matches or suchlike and so always move first and secondly the Northern Princess is the only major piece in the game that cannot force checkmate with the lone help of the Queen against a lone Queen – the Adviser of the Capablanca pieces can. Notwithstanding this Crossfire is tactically complex enough to offer enough scope for possible winning chances to either side and games may be even more tactically complex than Storm. Note that with Crossfire, as with Storm, the Southern King is forceful as also is his Precedent and his Adviser unlike the Southern Prince and Princess in Storm. The player with the Capablanca pieces is described as having the Precedent and Adviser. This is as for Storm. Note that the Northern Dwellers are deployed as shown for Storm. The Precedent – he can move both as can a Rook or a Knight. The Adviser – she can move both as can a Bishop or a Knight. Foresters only differ in some promotion choices i.e. they can be exchanged (they actually free them) for a captured Precedent or Adviser (as well as a fellow captured King), otherwise their choices are the same as for Storm. The notes on the two board variations given in the introduction for Storm also apply to Crossfire. The notes of Storm including that on the board variation also apply to Crossfire. The material advantage of the Storm pieces (the Prince and the Princess) over the Capablanca pieces (the Precedent and the Adviser) can be seen here and one of their advantages is that they can attack along the board into the opposing position whilst being shielded (the commencing position shows this) whereas the Precedent and the Adviser (or the King) cannot do this without leaving a line of attack open against themselves. The King is the only one of these pieces with no leaping abilities but later on in a game when the board becomes more open he may become the most powerful piece due to the many squares his lines of attack can cover when they are not blocked. With her leaping abilities and four forward lines of attack the Princess may well be as powerful as even the King in the opening and middle game but, as stated earlier, she cannot force Checkmate (with just both Queens also on the board) as can all these other pieces. Various possible exchanges of the powerful pieces listed above can lead to a number of different combinations of these pieces opposing each other in Crossfire (and Storm and also Capablanca chess), and some players find such asymmetry gives interesting scope to a game; also these exchanges can sometimes lead to a game with some resemblance to Western chess, particularly on a 10x8 board, and so Western chess is not entirely lost with these games. It has been said that the Precedent and Adviser of Capablanca chess are the two most popular "variant" pieces (those outside of Western Chess). In all variations individual pieces are usually referred to as Northern or Southern but Orange or White is allowed and in addition and also in all variations the Northern/Orange (but not the Southern/White) King, Queen, Prince and Princess can be referred to as the Storm ..... e.g. the Storm King or the Storm Princess etc. Players in all variations are usually referred to as the Northern Guardian or the Southern Guardian but Orange Guardian or White Guardian is allowed as is simply North or South or simply Orange or White. 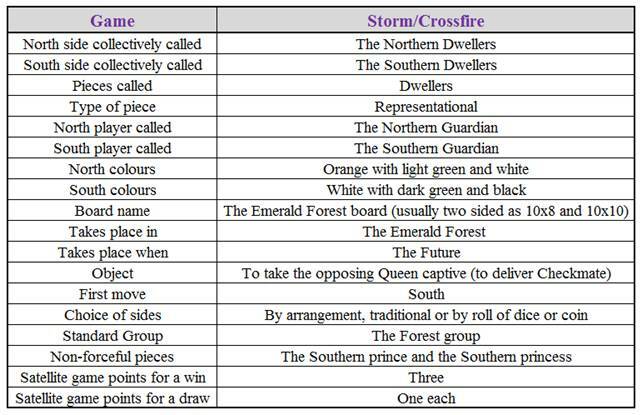 The games of Storm and Crossfire and the two board variations can be combined into a single procedure of choosing for tournaments, matches or social or exhibition play or suchlike. The procedure for deciding what is to be played is that the host organiser or player sets the board upmost to 10x8 squares or 10x10 squares to decide the board variation and then the guest player chooses the Storm or Crossfire pieces to decide the game variation – sides are decided as shown in the Information table. Choosing in reverse order is also possible. As well as being Stand-alone games some of them may suggest themselves as forming a related group and where this happens they can be played as a grouped format by individuals or by teams of small numbers – up to four, large numbers would not allowed – and where additional points can be scored as a group bonus for an overall win as determined by total points scored for and against. Points for each individual game and bonus points are shown below - where teams play points are shared as they agree between themselves. Of the games that follow - and as already stated in the general introduction - the basic rules of how to play Western chess and Chinese chess and Capablanca chess are readily available as they are for Arabian chess and Mongolian chess. The other games, excepting those of the Jewel Series group, are those forming A Chess Set and have already been described. 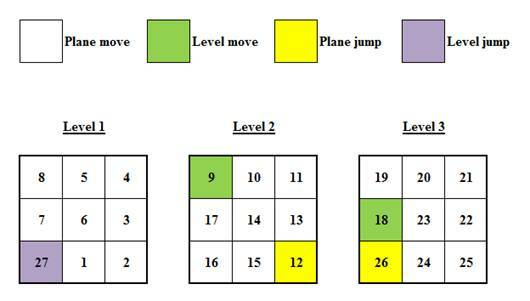 It is hoped that by grouping games into groups this will result in more than the sum of the parts of the individual games: A study of the workings of groups - see below, shows that tense situations can arise with many points at stake on the outcome of one game and this in turn can depend on a single move, for example if scores are level in the Meridian group at the commencement of Combination then a win in this game effectively scores seven points - two for Combination itself plus the five group bonus points that would have been secured; also the bonus points can exceed the sum of the points scored for individual games by the group winner(s), for example three points scored in the Chequered group for the individual games secures the group bonus points of four. Also an example is given of Swing scoring with a possible Mini group. The overall object of playing a group is partly to maximise points scored for individual games and also to score an overall win and so also to win the group bonus. The Jewel series and Woodland parallel groups do not consist of any of the games of A Chess Set and are included here to show a different possibility of workings of grouped games, but the games themselves are described elsewhere and so only Northern Light and the tie-break game of Relay are fully described, but the games of Duel and Skirmish are included with sufficient description to play and with actual moves of example games to illustrate the ideas of these type of games. 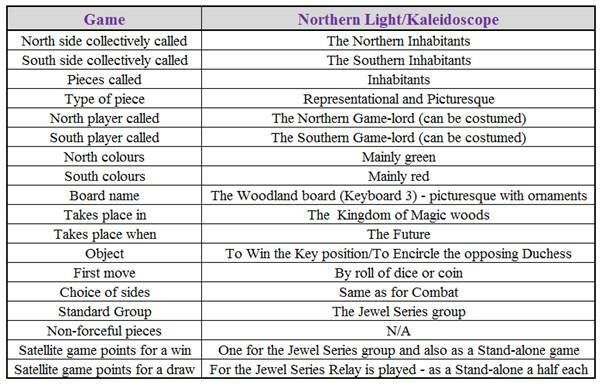 The game variation of Kaleidoscope is included with Northern Light and these two games together form the Woodland parallel (or simply Woodland) group whilst the Realm transfer (or simply Realm) group has games played with a different playing format altogether; also discussed are the Relay Swing scoring system and Mini groups. Note that the Jewel series group can be called simply the Jewel group. After Rules and Notes and the Jini group - next, an introduction and a table to the mechanics of the Jewel group’s working is given followed by Northern Light with Kaleidoscope and the Woodland and Realm groups, then Relay and Swing scoring with Mini groups and then Duel and Skirmish, also the Runich dice is shown. Notwithstanding their basic rules, Chinese chess and Western chess and Capablanca chess must all accord respectively with QiPlacements/Encounter and LancerChess/Clash and Storm/Crossfire with regard to their rules and piece types and piece names, role reversals and protecting Queens, boards and so forth. In these groups (here excluding the Jewel Series) players change sides for the second and third games and then for the first Tie break game but do not change sides for further Tie break games. Sides for first games are decided by arrangement or traditional means or by roll of dice or coin - sides mean north and south, however named. Tie-break - if the scores are level after the group games are played then two games of Arabella are played, one Traditional variation and one Modern variation (see Arabella), with a roll of dice or coin to decide what order they are played in. If the results of these are level then a game of Invasion (Traditional variation and where those of the Kingdom, who are north, have the Talismans - see Arabella) is played and if this game is a draw then the player of north, who has moved second three times, is awarded a nominal win and the group bonus points. There are no points scored for these games of Arabella/Invasion themselves as they are played only to decide who wins the group bonus points. Statistics for Western chess show that white (south), who moves first, would have about a 40% chance of winning a Tie break such as above if of three games of Western chess, but of course this may not apply to Arabella and also Invasion has preset asymmetry. It should also be said that though north may appear to be at an advantage in a Tie break he may, as south, be at a disadvantage in the group third games where there is preset asymmetry. For standard groups clocks are mostly set at typical tournament times and are Phased Countdown or Phased Increment or Phased Combination clocks throughout - with Phased combination being preferable, except those used in tie-break games are Phased Swing clocks - with the standard variation being preferable, set at faster times (typically a third or so overall time of typical tournament times is allowed). Independent Single countdown clocks are set throughout – see Part three: Phased Clocks for Games for an explanation of clocks and where suitable tournament times are included as examples. Standard groups score Satellite game points throughout. Arabian chess is modified so as to accord with Arabella/Invasion in certain relevant rule and representational aspects - refer to the Characters of Enchantment in Invasion in Arabella. The playing of the Tie-break would follow the pattern of Arabella games as described above. Each game has one or two points for a win but if this is a draw then the tie-break game of Relay is played and the winner of this receives the game point(s).....this is different to the other groups shown above where the tie-break game is played (if necessary) only after all the games have been played. At the end of the series there will be a winner (or winners if a team) because there are seven total game points and half points are not scored because of the tie-break for each game.....the winner then receives the five bonus points that the group series carries.....also for each game except the last the winner can choose to have an advantage (alternate bonuses) taken into the next game instead of receiving the point(s) for the game and in this case the game point(s) is carried forward and the winner of the next game can receive the full points including the carried forward point(s) or take an advantage into the next game instead and this can be repeated until the last game and so it is possible for up to seven points to be won - for the last game that is - and in this situation the bonus of five points would also be decided by the result of this game unless a tie-break were needed - twelve points in all.....the maximum points for a single game in the other groups is nine – by the Storm games, but this Forest group can carry more possible total available points – fourteen in all. In contrast to the previous types of groups players play the same side throughout the series other than the practice game of Duel. Jewel is meant to be mainly played as a Group Series of games but can be played as Stand-alone games as is shown in the following table. Note that the choice to move first in Combat by the winner of Skirmish is only if the Alternate Bonus choice is made. Only in exceptional or extraordinary circumstances would a game of Relay not lead to a win for one side. 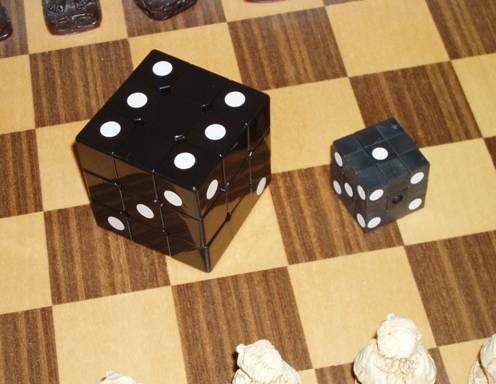 A roll of dice occurs or is mentioned in places throughout A Chess Set and a possible (and preferred) type of dice is the Runich dice and after Skirmish a description and picture of this is given. As with all the games of the Jewel series Northern Light does not have Checkmate as its winning objective but to Win the Key position - or simply to Win the Key - and this may be considered as something of a novelty, and so there is not a Royal piece as in usual Chess games though Northern Light has a Princess that could be thought of as a Semi-royal piece and the Key position is what could be thought of as a Royal square, particularly in the background circumstances of the game. Despite these differences however a good amount of Chess is present in the game with most of the pieces of Western chess on the board and there are similar tactics and so forth, but there are also different strategies to those of usual Chess games due to the differing nature of Winning the Key position compared to Checkmating the Royal piece and this may require different piece manoeuvres that some may find an interesting change. As with other of the Jewel series games Northern Light could be described as a Convergence game. In a future time and in a Kingdom of Magical woods the Inhabitants are at a crossroads and possibly in a crisis, for a talismanic gemstone of great size and potency has been discovered in the Kingdom. This stone has been named as the Northern light and such stones with their potential for good are so rare as to be almost unknown and have attained near mythical status. The discovery of the stone has come at a time of dispute, for there are two young Princesses who have rival claims to the Kingdom’s vacant throne, and whoever succeeds with their claim will also take possession of this stone that has in the meantime been given over to the safe-keeping of trusted inhabitants of the Kingdom. After much debate it has been agreed that the succession dispute and possession of the Northern light will be decided by means of a game where the rules of the game must be followed and it is a duty of care not to intentionally inflict injuries on opponents in the normal course of events. The Princesses and their supporters have been designated for the purposes of the game as Green (north) and Red (south). For Northern light the Primary object is to Win the Key position – square D4 and this wins the Northern light (game). The winning Princess also succeeds in her succession dispute. Moves are made alternately, but see below. The D4 square on the board is the Northern light itself and is the Key position and acts as a block to sliding pieces i.e. the Aristocrats and Nobles (described below) and these pieces cannot move over the D4 square, they can however like all pieces move to or capture on the D4 square. Knights (described below) are unimpeded in their movement by the D4 square. Princess – she moves as a King, but though of Royalty she is not vulnerable to check or checkmate and so two Princesses can occupy adjacent squares or capture each other etc. Not being vulnerable to check or checkmate players should not give warning of her possible capture by saying 'Check' or similar. Page - he moves as do Pawns of Western chess but does not have an initial move option of moving two squares and so the en passant rules do not apply. Upon reaching his end rank a Page must promote to an Aristocrat or a Noble/Equerry or a Knight. An Equerry moves the same as a Noble except that his set of diagonals are not those of the Key position whereas a Noble's are and so an Equerry, not being impeded by the Key position, is relatively more free-moving and he should have some difference of appearance to a Noble. A Princess needs to have reached and occupied the Key position of D4. The Princess must hold (occupy) the Key position for the immediate next turn of her opponent. This means that her opponent must capture her immediately or lose the game. The opponent can capture the D4 occupying Princess with any of his pieces including his own Princess (who would then herself need to be captured immediately or would win the game). The loss of a Princess does not necessarily lose the game as a draw may still be possible; however the loss of both Princesses results in a draw (by lack of material). If one side has all his pieces captured then the opposing Player may carry on moving until Wining the Key (if possible, or the game is a draw). The capture of a Princess does not score any additional or bonus points. There is no significance in a piece occupying D4 other than a Princess. As stated there is no castling type move. If a player cannot move he must pass his move. The capture of the opposing Princess ensures at least a draw and so can be considered a Secondary object that effectively scores a half point - as much as the player would effectively further score for subsequently Winning the Key. Although there is no castling the Key position can shield a Princess from attacks by Aristocrats and Nobles, and the Nobles all move on the same diagonals as the Key position is on and so the other set of diagonals are safer from attack in a different way. Giving Pages a two square initial move option could give the first side to move too much of an initiative on this size board and the en passant rules could be too influential - Pages as they are take five moves to promote, the same as Pawns do in Western chess but only when they first move two squares - they take six otherwise, on average then Pages take less moves to promote than Pawns, but on average they take more moves to cross the centre of the board and move into opposing territory - three, whereas for Pawns it is two or three depending on their first move. Being unimpeded by the D4 square an Equerry may be advantageous in certain situations and - Representational, as a promoted and free-moving Page who is young he may be considered a dashing young officer with a bright future - should his Princess succeed that is. Representational - the board’s D4 square should have a suitable Northern light gemstone ornament. 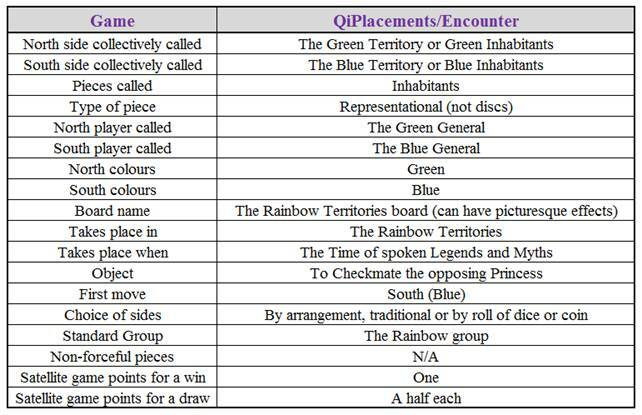 Players or Sides or pieces can be called Green/Red or North/South or as in the Information Table below. Choice of sides is decided by arrangement, traditional or by roll of dice or coin. The object of the game is to Encircle the opposing Duchess – Encirclement is identical to Checkmate and so players should say 'Check' when the Duchess is under attack but this is not compulsory. The Princesses are replaced by Duchesses who are identical to the Kings of Western chess. The board is identical except that the D4 square should have an ornamental Crown (called the Woodland crown) instead of an ornamental Northern light gemstone - the D4 square still acts as a block to sliding pieces in the same way as with Northern Light. Players cannot pass a move as with Northern Light and Stalemate would apply to Kaleidoscope. Scores are one Satellite game point for a win and a half each for a draw. The background and representational points of Northern Light also apply to Kaleidoscope except that the rivals are the Duchesses instead of the Princesses. In other respects the games are the same. South moves first in both games. Players may only move first in one of the games. Choice of sides (on the game one board with the opposite side then applying to the same player on the game two board) is decided by arrangement, traditional means, or by roll of dice or coin. This effectively decides who moves first overall. Firstly the Horizontal crossover pattern: 1. South game one, 1... North game one; 2. North game two, 2... South game two; 3. South game one 3... North game one; and so on. Secondly the Diagonal crossover pattern: 1. South game one, 1. North game two; 2... North game one, 2... South game two; 3. South game one, 3. North game two; and so on. Moving pattern is decided by arrangement or by roll of dice or coin. The game one board is on south's left-hand side. What game is played on what board is decided by arrangement or by roll of dice or coin. Direction of moves are (or start) clockwise. It is possible for each game to have its own set of clocks, but players could be considering a move for one game whilst their clock was running for the other and one set of clocks is generally preferred to a dual system, but players may need to be careful about when they press their clocks. The background story of the Woodland group is that the Kingdom of Magic woods is split between rivalries for the Northern light and rivalries for the Woodland crown (succession to the vacant throne) and that the Princesses of Northern Light are rivals for possession of the Northern light whilst the Duchesses of Kaleidoscope are rivals for the Woodland crown, however these sets of rivalries remain separate and do not meet. 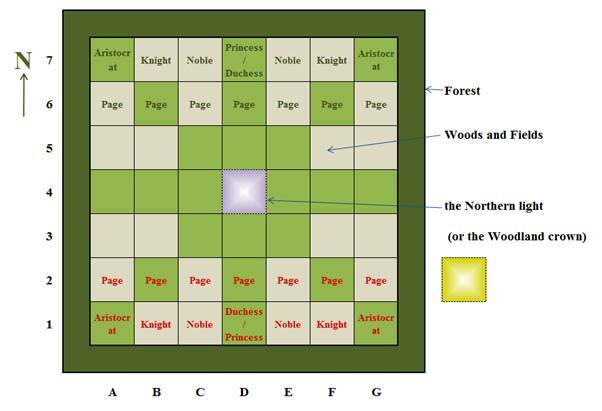 With Northern Light and Kaleidoscope a comparison can be made between the different type of games that are produced by the different objectives of a Princess Winning the key and Inhabitants Encircling a Duchess and when the Woodland group is played this comparison can be made as the games happen - some might find it interesting to observe the games when played in Parallel format. The Parallel playing format could be used for other Head games (as they are called) – Storm on the different board sizes for example, or the same Head game on both boards, or various other Chess games or variations of them, or mixed games - perhaps of a much different type, and this format might suit exhibition play, but only the Woodland group in the above format is currently a standard group for this format. Following on from Parallel playing is another playing format called Transfer playing and this is based on and very similar to a popular Chess game and its variations called Alice chess that was invented by Vernon R Parton. The standard Head games for playing with the Transfer playing format are LancerChess – described earlier, and Western chess, and where so played this would be called Transfer chess. Note that the roles of the King and Queen in Western chess have been reversed though their commencing positions are the same – this follows the pattern of LancerChess. There are two standard 8x8 chessboards placed alongside each other – board one and board two (board one is on south’s left-hand side) and both boards have north and south at the same ends. The object is to Checkmate the opposing Queen. Choice of sides is decided by arrangement, traditional means, or by roll of dice or coin. A. all pieces for both north and south are deployed as usual on board one. This is called the Vertical closed variation. B. all south’s pieces are deployed as usual on board one whilst all north’s pieces are deployed as usual on board two. This is called the Diagonal closed variation. C. all pieces for both north and south are deployed as usual on board one except for their Royal pieces (the Queens) who are deployed on their usual squares on board two. This is called the Vertical open variation. D. all south’s pieces are deployed as usual on board one except that his Queen is deployed on her usual square on board two, whilst all north’s pieces are deployed as usual on board two except that his Queen is deployed on her usual square on board one. This is called the Diagonal open variation. Deployment variation is decided by arrangement or, if not, two rolls of dice or coin decide, where first roll decides either one of A or B or one of C or D and second roll decides between either A or B or between either C or D.
A move must be legal before transferring. The destination square on the other board must be unoccupied but intervening pieces on this destination board can be (effectively) jumped over. A Queen may move to a square correspondingly occupied on the other board (see Further thoughts). 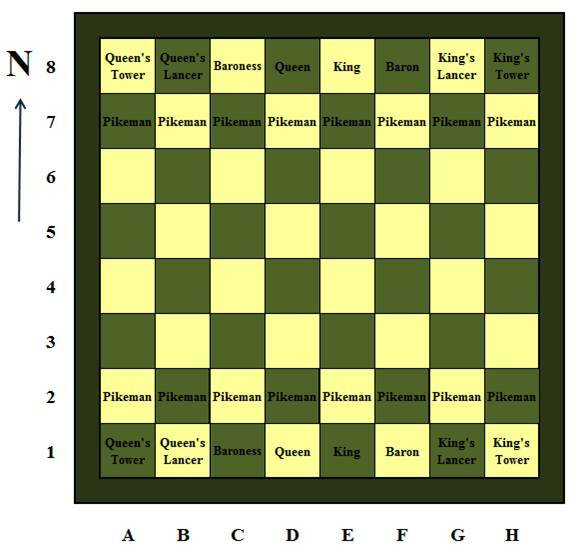 Where a Queen is so situated as above and in a Check or a Checkmate situation occupancy of the corresponding square(s) on the other board is discounted, i.e. the effectiveness of pieces checking a Queen is not reduced in any way by such squares. A Queen must escape check if possible and a piece from the other board may be transferred to block the check. Players must alternate moves as usual but do not have to alternate their moves between boards. En passant captures are not allowed throughout all variations. Castling or suchlike is not allowed throughout all variations. Players should state Check when the opposing Queen is in check though this is not compulsory. 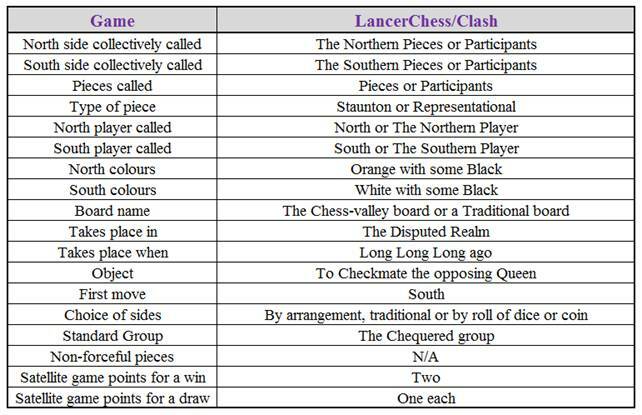 For all variations played with this format and played as Stand-alone games LancerChess scores two Satellite game points for a win and one each for a draw and Western chess scores one Satellite game point for a win and a half each for a draw. This is a group played by two players with the Transfer playing format. A player winning both the games in this group would score five Satellite game points in all, but they must be played as Transfer chess for the bonus points possibility to apply and both games must be won otherwise the usual Stand-alone points are scored. The (limited) background story is that told of earlier in LancerChess – see LancerChess, but there is additional background in that with variations A and B the Queens are with their armies for their (relative) shelter and safety whereas with variations C and D they have been cut off from their armies due to a misunderstanding of messages sent to them.....this background also applies to the games when played as Stand-alone games in this format. By confining the Queens to one board a certain amount of their scope is reduced than is otherwise, but this may sharpen the focus on the game's object to checkmate them and also the Queens may have safer escape moves cut off and so their positions may, depending on the deployment variation, be more precarious and some may find these things to be of interest. A further point of possible interest is that Queens can indirectly guard their own pieces (and also opposing pieces) on the other board by occupying their corresponding square since capture of this piece would not be allowed as the Queen occupies the destination square on the other board of the would be capturing piece - in this way a centralised and entrenched piece can be established on a board, but the Queen's position may be very precarious on the other. There are other Chess games that could be played in this format and it is possible to have more boards and transfer rules for them, but only the Realm group is currently a standard group for this format. Relay is a game of three stages where each stage is larger than the one before and could be described as a series of Race games and the use of a dice brings a fairly large element of luck into the game though it is not without skill and the game can be played by teams of up to three players. It is very broadly based on Backgammon, but perhaps more so on Ludo. There are two standard variations: the Running variation and the Obstacle variation, and the relatively few rule differences are noted - the Obstacle variation is the one used as the tie-break game for the Jewel series. Games in A Chess Set do not use a dice during the course of play when moves are made, but sometimes a game involving the luck of a dice may make a change from Chess and with Relay even an inexperienced player has a chance of winning against a strong player. 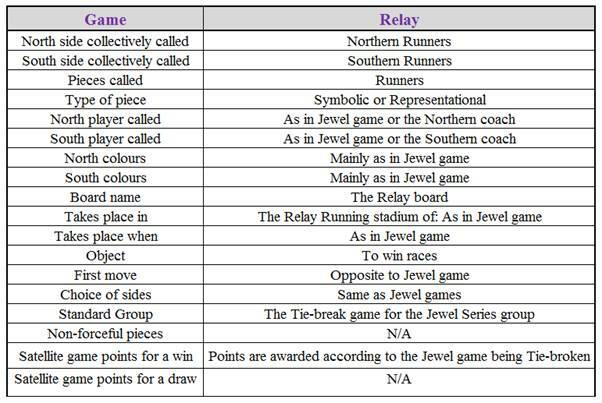 A game in the Jewel series has finished in a draw and because games must be decided as they happen the game of Relay is played and this consists of up to three races that take place in the stadium of a running club. The object of the game of Relay is for both a player’s runners to return to their Starting/Finishing square (see Further thoughts) before both the opposing runners do so – this wins a race, and the first to win two races wins the game. After players have started the Starting squares then become the Finishing squares. Each side has two runners (can be a boy and a girl) for each of their three distances as shown on the board i.e. short, middle and long. Prior to starting each race the runners are situated as shown on the board and these are called their Waiting squares – D2/D6 and D1/D7 and D-Southern surrounds/D-Northern surrounds. The runners' corresponding Starting squares are D3/D5 and D2/D6 and D1/D7. One standard dice or preferably a Runich dice of suitable size – see next, and a rolling cup are needed for races. For the middle and long distance races all six sides of the dice are used. For the short distance race only amounts of one to three are used to move runners and the method used is that if a four, five or six is thrown then the number on the opposite side of the dice is turned up and shown and used. Opposite sides of a standard dice add up to seven and so this method works to give equal chances to moves of one two or three squares. Players start first with the Short distance race and these runners are then moved to their Starting squares of D3 and D5. The first player to move throws the dice and must move a runner clockwise the number of squares he has thrown on the dice and so if he has thrown a two (or a five) he would move a runner to square C4. After the first move the opponent does likewise and moves one of his runners clockwise according to the throw of the dice and were this a four (a three is opposite to this) he would move one of his runners three squares to square E3. Successive moves are simply made in this way until and unless a runner is sent back to their waiting square. Sending back means that a runner on the track must return back to his Waiting square and so to complete his race he must start again. There are two ways to send back an opposing runner and they are what are called forward sending back and diagonal sending back. Forward sending back occurs when a runner lands on a square with a single opposing runner on it who is then sent back. Diagonal sending back occurs when the square that a runner lands on leads diagonally across clockwise to the next side of the board with a single opposing runner on it e.g. if a runner landed on C4 then a single opposing runner on D5 would be sent back; example squares from the Long distance track are A3 sending back on E7; D7 sending back on G4; G3 sending back on E1 and so forth. The central square of D4 is the Clubhouse (a representational point) and acts as a block to diagonal sending back however and so a runner landing on any corner square cannot diagonally send back an opposing runner. As can be seen it is possible for a sending back to occur both forwards and diagonally on the same move and this is called a Double sending back. 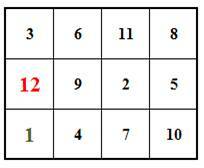 If a square is occupied by two runners of the same side then neither may be sent back and this is called a Protected square and the runners are called Protected runners – an opposing runner may still land on such squares however. As can be seen it is possible for one runner of each side to occupy a square and this is called a Critical square as a runner landing on it sends back the opposing runner whilst he and his fellow runner are then Protected runners. Squares can also be safe from a sending back if no possible dice roll can do so and these are called Safe squares and any runners on them are called Safe runners. Note that all these situations are only while they last as such and would constantly change. A player may not choose to pass a move. Running variation - for a runner that has been sent back a player must re-enter him to the race from his waiting square to his starting square on the player's next turn (the dice is not thrown) and he may not send back an opposing runner when this happens - effectively he loses a turn but re-entering back to the starting square does not constitute passing a move. Obstacle variation - for a runner that has been sent back a player may choose when to re-enter him to the race from his (safe) waiting square to his starting square (the dice is not thrown) but he may not delay re-entering if this would mean choosing to pass a move (for example, if his fellow runner finishes his race then he must re-enter without delay) and he may not send back an opposing runner when this happens - effectively he loses a turn but as with the Running variation the re-entering does not constitute passing a move. Runners cannot block other runners when they are moving and a runner simply overtakes any runner in front of them if the throw of the dice takes them past them. If a race has not ended after a set number of moves have been made by each player called the cut-off point (the numbers are stated later) the rules change and now there is no more sending back at all. The player who moved second when commencing the race now moves first for this phase of the race. The two phases of the race can be described as pre cut-off (this includes the set move number) and post cut-off. The object of the race is the same and should now be reached. Note that it is not necessary for a player to throw the exact amount on the dice to land on their starting/finishing square for a runner to complete their race but only the minimum necessary and the runner then returns to (is placed on) the Clubhouse - a runner can send back an opposing runner with this move but only if on his Finishing square and only if the exact amount on the dice is thrown to land on it. After the completion of the short distance race players then commence the middle distance race with first move reversed from the short distance race and the winner of the short distance race receives an extra throw of the dice to start with. After the completion of the middle distance race players then commence the long distance race if needed – one of the players may have won the required two races, with first move reversed from the middle distance race and the winner of the middle distance race receives an extra two throws of the dice to start with. There are further ways of playing a sending back besides the two variations given; for example a runner could be sent back to his waiting square and re-entering to his starting square (or dice counted square) could require the highest possible roll of the dice. There could be more runners etc. but the above is standard. If preferred the term Flat races can be used instead of the Running variation and Jump races instead of the Obstacle variation. Players or Sides or pieces can be called simply North/South. A different team member may play each race. Starting/Finishing squares may differ in appearance from other squares. With the Obstacle variation a player has the possibility of positioning runners to give more likelyhood of sending back opposing runners and so an extra element of tactics/strategy is present that is not in the Running variation and some might prefer this. A game, for example LancerChess (numerous others are possible), has resulted in e.g. a draw and so points are level at 1-1. A game of Relay is played (preferably the Obstacle variation). The winner of the short distance race has a point added to his score and so is one point ahead of the loser i.e. 2-1. The loser of the short distance race can choose to accept the score and then players keep their points or he can choose to play the middle distance race. If the Middle distance race is played the winner has one point transferred from the loser's points total. The score is now either 3-0 to the winner of the short distance race or 2-1 ahead for the player who was the loser of this race. If the score is 3-0 this ends the game with the final score as 3-0. If the score is 2-1 then the loser of the middle distance race can choose to accept the score and then players keep their points or he can choose to play the long distance race. The winner of the long distance race has one point transferred from the loser's points total. The score is now either 3-0 or 2-1 and this being the final race this is then the final score. Note that if LancerChess had finished 2-0 then a score of 3-0 could have been possibly reached earlier than in the example. If a player has zero points upon finishing the short distance race or the middle distance race this ends the game and the game may not extend beyond the long distance race. Other games have other scores/results and so before Relay commences there may be different amounts than shown above for each player, but the principle is the same and equal amounts are always at stake for transfer. There are no bonus points in the way of other groups though Relay gives an additional point. The score amount transferable is the lower of the players' point scores up to a maximum of one point - it is not permitted for players to go below zero at any stage. Authorisation would be required for this system of play/scoring and there is currently no standard Mini group with this playing/scoring format. South moves first for the first (short distance) race. Choice of sides is decided by arrangement, traditional means or by roll of dice or coin. North colours are mainly Green, South colours are mainly Red. The game takes place in the Relay Running stadium of Bridge Green. The game takes place in the future. For both variations Satellite game points for a win are one. Different players may play the individual Races but how they share any winning point is a matter for agreement between themselves. For both variations in exceptional or extraordinary circumstances Satellite game points might be awarded of a half to each side. This practice game for the Jewel series is suitable for beginners to play so as to introduce them to the idea of Key positions.....the background, in brief, is that a Prince has arrived in a castle to rescue a Princess but is confronted by a Guard. Both are armed with swords and have a duel around a staircase (the B2 square and the Key position) that leads up to the room where the Princess is held captive – if the Prince wins he will rescue the Princess whereas if the Guard wins she will remain a captive. The object is to Win the Key position B2 (the Stairs) as described in Northern Light. Both the Prince and the Guard move as the King’s lancer of LancerChess and are not impeded by the stairs (B2) that they can jump over or land on or capture on. The rules are similar in essence of those of Northern Light that have already been explained and need not be repeated. 1. Guard to B1 - if the Guard moved to either A1 or C3 he would be captured and the Prince would then proceed to Win the key position. Moving to C2 is effectively the same as B1. 1... Prince to A2 – any other move loses.....if the Prince moves to C3 then the Guard moves to B2 and Wins the Key position as he cannot be captured immediately as required.....if the Prince moves to A1 or B3 then the Guard captures him. 2. Guard to B3 – again any other move loses.....if the Guard moves to C1 the Prince moves to B2 and Wins the Key position as he cannot be captured immediately.....if the Guard moves to A1 or B2 then the Prince captures him. 2... Prince to C2 – once again any other move loses.....if the Prince moves to A1 the Guard moves to B2 and Wins the Key position whilst moving the Prince to B2 or A3 allows his capture. And now both sides must jump back and forth across the Key position and the game ends by threefold repetition of moves/position. It is not possible to force a win. Skirmish is the first game played in the Jewel series but could also be played for practice by players who are inexperienced in the idea of Key positions.....the brief background is that somewhere in a Forest a dispute arose as to rights of way between two patrolling sets of guards and this led to a Skirmish to decide what set of guards would have priority at a main crossroads. Object: The object is to Hold the Key position B2 (the Crossroads) and this is the same as to Win they Key position except that any piece can do so, not just one. Pikeman – he is identical to the Pawn of Western chess except he has no initial option of moving two squares and upon reaching his end rank he must promote to a Pike commander. Pike commander – he can move or capture one or two squares in any direction but cannot jump i.e. he can only slide. The rules are similar in essence of those of Northern Light that have already been explained and need not be repeated, except to say that the Crossroads do not impede the move of any sliding piece (a difference to Northern Light). c) if north replies in kind with Pikeman to A2 then south promotes his Pikeman by capturing north’s Knight and.....if north then once again replies in kind by capturing south’s knight and so promoting his own Pikeman then south captures north’s Pike commander with his own and south will then move to Hold the key position.....or if north promotes on A1 instead of capturing south’s Knight on B1 then south plays - Pike commander to C2! and north cannot avoid the capture of his Pike commander on the next move and then south will move to Hold the Key position. There are several types of clock in use for timing chess and a game of chess or such at any type of event or at any level is not tied to using any particular type of clock or actual time settings on such clocks – this can be decided by organisers, tournament committees etc. Also at points during a game there is sometimes a switch to another type of clock as is for example the case in the 2016 world Western chess championships final. The type of clock used may give rise to different approaches to managing clock times and so an element of additional skills can enter into games. This is where a fixed amount for the whole game is entered onto both players’ clocks and where this amount simply counts down on each move and a player will lose the game on time when his amount counts down to zero. These are sometimes called blitz time control clocks, particularly for very short games; but I prefer the term Single countdown clocks and they are mostly used for games of up to about 30 minutes for each player. There are also what could be called tournament or traditional or fixed control or classical clocks whereby a specified number of moves must be played within a certain period of time e.g. 40 moves within 100 minutes and this time control is then followed by another time control e.g. the next 20 moves within 50 minutes and then usually there is a third and final time control that may be e.g. 15 minutes plus an increment of 30 seconds a move for the rest of the game – note that unused time is carried forward to the next time control. The afore-going clocks and settings are those to be used for the 2016 world Western chess championships final and the third time control for the remainder of the game with an increment is in fact a different type of clock to the traditional one and is called the Fischer clock and this is described next. These clocks were the idea of Robert (Bobby, as he is usually known) Fischer and consist of firstly entering a balance onto each player’s clock and then for each move a player makes his clock has an additional fixed increment added to it - for example: Initial balance 120 minutes with an Increment of 60 seconds. The use of increments with clocks is becoming widespread including at fast times. Bobby Fischer was a world Western chess champion. Mention should also be made of these clocks, though rarely used in Chess for tournaments etc., whereby an initial amount is entered onto each player’s clock and whilst they are moving their clock counts down whilst their opponent’s clock increases by the same amount – if a player’s clock counts down to zero he loses the game on time. Phased countdown and Phased increment clocks that follow are somewhat based on Fischer clocks and other clocks but whereas Fischer clocks were intended to mostly end time pressure and eliminate what are called time scrambles these two phased clocks do not aim to do so but rather to reduce them as sometimes time pressure is an interesting and valid feature of a game and time scrambles may on occasions bring a dull game to life. Note that full clocks information including settings must be displayed to players, referees and spectators etc. throughout a game. Firstly, for each player an amount called the Main balance is entered onto what is called the Main clock. Secondly, for each move a player makes a fixed amount called a Reserve increment is added onto a separate Reserve clock as it is called – this is different to Fischer clocks where the increment is added to the same clock as the main balance is entered onto. The reserve clock is not used until the main clock has counted down to zero. Thirdly, when his main clock has counted down to zero the player then uses his reserve clock where no more amounts of time are added to and so this clock acts as a single countdown clock and if this counts down to zero the player loses the game on time. An example would be for a main balance of 120 minutes and with a reserve increment of 60 seconds. As can be seen the player has a degree of control of how much reserve time he builds up as by moving quickly he will have a larger reserve time when he switches to his reserve clock due to more increments in a given time. A variation of this type of clock is to include a further iteration when using the Reserve clock and using a Secondary reserve clock.....(this acts as did the Reserve clock - now called the Primary reserve clock and with a Primary increment).....and with the same or a different Secondary increment to the first iteration, for example 30 seconds - iterations could continue but this would be most unusual. Both variations of Phased Countdown clocks are allowable for the very highest level tournaments or matches or suchlike with the triple controls being generally preferable. With all Phased Countdown clocks and in any meaningful or significant game players would have an overall time limit (for example 200 minutes for each player and this amount would correspond to the above example times for triple controls with perhaps 180 minutes if not triple) and this would be entered onto Independent Single countdown clocks and these clocks count down continuously but only take effect if a player’s Phased clock is still running and so a player can lose on time before his Independent clock counts down to zero (when he would lose whatever the situation was on his Phased clock) – the time entered onto these Independent clocks allows for such as clock pauses, intervals etc. The purpose of these clocks is to prevent an excess of time allowed to that intended. These clocks can be simply referred to as the player's Independent clock or Independent Countdown clock. Firstly, an amount called the Initial Balance is entered onto each player’s clock. Unlike Phased Countdown clocks there is only one clock for each player - but see below, and this is called the player’s Compound clock. Secondly, for each move a player makes an Increment of a fixed amount is added to his clock but in contrast to Fischer clocks this is only for a set number of moves called the Cut-off point. During this phase of the game (the pre cut-off phase) if a player’s clock counts down to zero he would lose the game on time. Thirdly, at the cut-off point a Final increment (this could be called the Cut-off increment) is added to each player’s clock – this is different to Fischer clocks where the increment is of a fixed amount throughout the game. Fourthly, (the post Cut-off phase) the clocks now act as Single countdown clocks with no more time added to and if a player’s clock counts down to zero he loses the game on time. An example would be for an initial balance of 60 minutes; an increment of 60 seconds with a final increment of 60 minutes at a cut-off point of 40 moves. These settings would give a maximum time allowed for the whole game for each player of 160 minutes. As the example shows (assuming the game runs to more than the Cut-off point) up to the Cut-off point of 40 moves the maximum time allowed for each player is 100 minutes but a minimum of 60 seconds a move is allowed and so players have less flexibility than with Phased Countdown clocks but have more certainty of periodical times allowed. Note that the Final increment is added immediately after the actual making (in the above example) of move 40. A variation of this type of clock is to include players each having their own choice (within set limits) of their own initial balances and increments and also final increments and cut-off points, provided the predetermined overall maximum time for the whole game for each player were not exceeded. Both variations of Phased Increment clocks are allowable for the very highest level tournaments or matches or suchlike and both have equal preferability. Note that where this clock variation is used players must simultaneously declare their settings to the referee immediately prior to the game commencing. A spreadsheet template with example figures for this clock variation is shown below and example range limits are also shown. Independent Single countdown clocks as explained in Phased countdown clocks are set for all significant games using Phased increment clocks with 200 minutes entered being an example and this would correspond to the above template amounts as the time entered would not be less than the maximum allowed for the game in either variation. There is also is a combination of standard Phased Increment clocks and standard Phased Countdown clocks whereby clocks are as a standard Phased Increment clock but (using the alternative way of displaying mentioned above) when the initial clock counts down after the final increment (now called the Cut-off increment) has been transferred there is, as with a standard Phased Countdown clock, a reserve increment added to a separate Reserve clock for each move - for example 30 seconds or 60 seconds, and after the initial clock counts down to zero this separate reserve clock is used and counts down as a Single countdown clock and if this counts down to zero the player loses on time. Independent Single countdown clocks as explained in Phased Countdown clocks are set for all significant games using Phased Combination clocks. This Phased Combination clock is allowable for the very highest level tournaments or matches or suchlike. Other variations of Phased Combination clocks are possible but this is the standard and accepted one. Firstly, an amount called the Swing balance is entered onto a clock for each player that is called their Swing clock. Secondly, an amount called the Reserve balance is entered onto a separate clock for each player that is called their Reserve clock. Thirdly, whilst a player is moving his swing clock counts down and his opponent’s swing clock goes up by the same amount.....if a player’s swing clock counts down to zero then his reserve clock is then used.....time used on the reserve clock does not increase the balance on either the opponent’s reserve clock or swing clock and after using his reserve clock the player’s swing clock will once again increase as his opponent then uses his swing clock.....if during this phase (the pre Cut-off phase) a player’s swing clock and then reserve clock count down to zero he would lose the game on time. It can be seen that the combined balance of the swing clocks is always the same during the pre cut-off phase. Fourthly, after a set number of moves called the Cut-off point both players’ balances on their reserve clock and swing clock are combined onto their reserve clock and these act as single countdown clocks and if a player’s clock counts down to zero he loses the game on time. An example would be for a reserve balance of 30 minutes and a swing balance of 30 seconds with a cut-off point of 40 moves. Players have with these clocks opportunities to directly impose time pressure by moving quickly and/or by introducing complexities and highly tactical or double edged situations into a game.....unlike standard hourglass clocks however there are possibilities with the use of the reserve clock to defend against these measures and so a game can take on an exciting hunter and hunted character and could even have the hunter and hunted reversed....it is also possible if both players’ reserve clocks run low or very low before the cut-off point for the clocks to become virtually as standard hourglass clocks – at least up until the cut-off point when the remainder of the game (the post Cut-off phase) could take on the character of a blitz game or even a bullet game, particularly with small swing balances of less than 20 seconds. Note that the combining of clock balances occurs immediately after the actual making (in the above example) of move 40. A variation of this type of clock is not having a cut-off point and so there is no combining of balances followed by a single countdown on the reserve clock, but Independent Single countdown clocks would prevent a game from going on indefinitely and so should be set for these clocks. Both variations of Phased Swing clocks are allowable up to high level tournaments or matches or suchlike and sometimes at the very highest level of such with the standard clocks being generally preferable. Independent Single Countdown clocks as explained in Phased countdown clocks are set for all significant games using Phased Swing clocks with 60 minutes entered being an example and this amount would correspond to the above example amounts for both variations. Where a piece lands on every square of a board the usual terminology is: a Closed Tour for where the piece can return to its commencing square or an Open Tour for where a piece does not or cannot return to its commencing square; but I prefer the term Circuit for where a piece can or actually does return to its commencing square and the term Tour can then be used for where the piece does not (or cannot) return so. Below are some possible solutions to Circuits and Tours mentioned above and in LancerChess - note that the numbering method for the Knights is different to that I have used for the King's Lancer and that I have used the A1 square as the commencing square throughout. 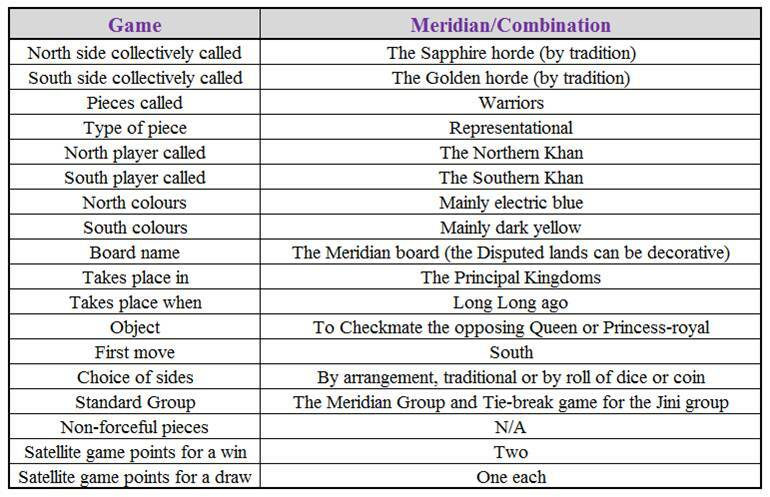 The Khan of Meridian has already been mentioned; also in Meridian there are a Pike commander and a Pike leader - a complementary piece that is not mentioned is a Senior pikeman who is able to move/capture two squares diagonally, though he cannot jump but only slide. 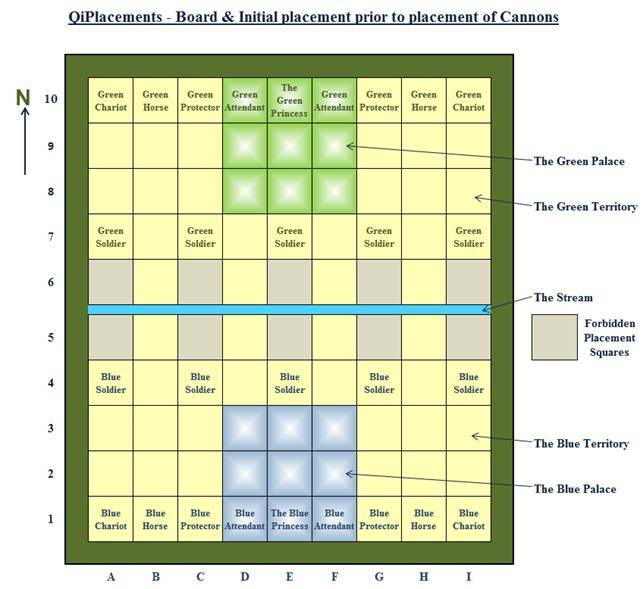 In LancerChess promotions to a Lancer could take place without reference to the colour of Lancers' commencing squares..
Queens in Transfer chess could be disallowed from moving to a square that has the corresponding square occupied on the other board. To win a race in Relay could require a Runner landing on a square past his starting square - this may be better at times for the mechanics of the game and practical playing would tell. A Chess Set. being a Handful of Games.